Buy a Flowers Fall calligraphy wall scroll here! This Japanese proverb is about the cycle of life, or how things come and go in life. This can be used to suggest that youth, fortune, and life can come and go (everything is temporary). These two characters mean flower fall (closes and loses its petals). It suggests nearing the end of something. A time that some might call "The sunset of life." 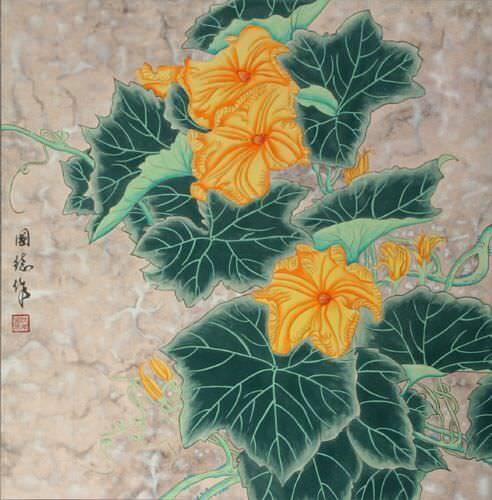 花落 often follows "flower open" to talk of the cycle of life. We offer this as a possible companion to a "flower open" scroll (to be placed side by side, or at either side of a doorway to say "things come and go" - a cool metaphor for a doorway). If placed in a doorway, it could be used as a suggestion to your guests that things bloom when they arrive through your door but wither when they leave (a great compliment). 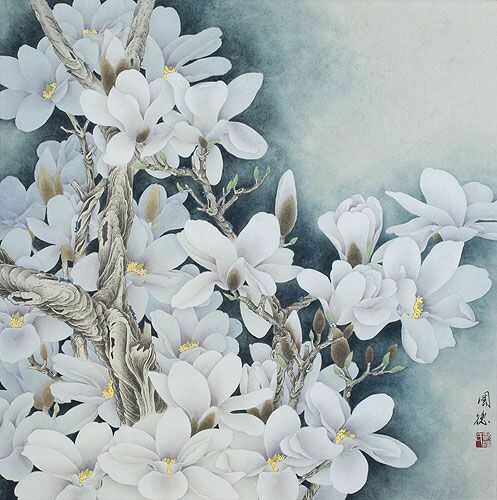 花開花落 is a complete proverb that lightly speaks of the cycle of life, or how things come and go in life. It is used as a metaphor to suggest that youth is a temporary state, which in time will pass. This can also be used to suggest that fortunes can come and go (everything is temporary). Note: There are two versions of this proverb which are very similar. The other uses a word that means wither instead of fall. 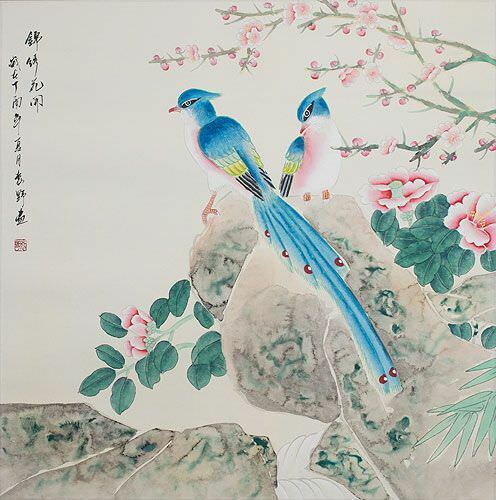 花開花謝 is a complete proverb that lightly speaks of the cycle of life, or how things come and go in life. It is used as a metaphor to suggest that youth is a temporary state, which in time will pass. Note: There are two versions of this proverb which are very similar. The other uses a word that means fall instead of wither. These two characters literally mean opening flowers (a verb). 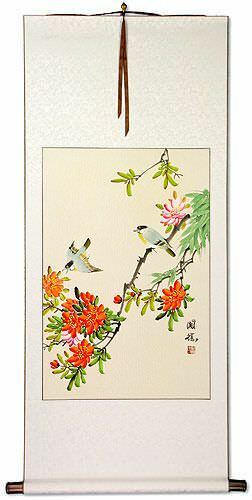 開花 is also associated with Springtime, the beginning of something, or youth. If you like flowers and the Springtime, this is a great selection for you. In Korean Hanja, this can be a metaphor for achieving enlightenment or becoming civilized (blooming civilization). These two characters literally mean "flower open." 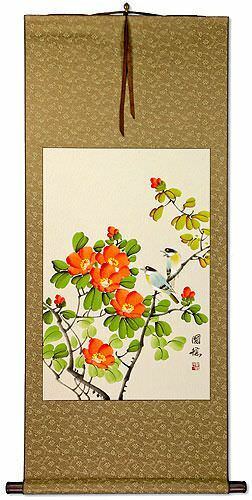 花開 is also associated with Springtime, the beginning of something, or youth. 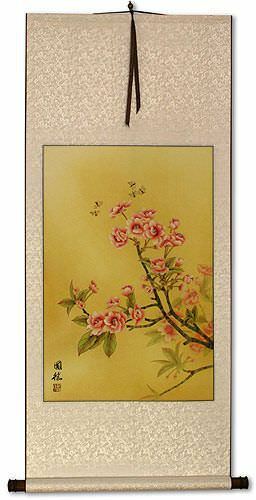 花開 is often followed by "flower falls" (closes and loses its petals) which means "Things come and go" or "Youth comes and goes." If you like flowers and the Springtime, this is a great selection for you. However, if you want the companion "flower falls" (flower withers), we offer that as a companion wall scroll or all together as a four-character phrase. This poem was written almost 1200 years ago during the Tang dynasty. It depicts traveling up a place known as Cold Mountain, where some hearty people have built their homes. The traveler is overwhelmed by the beauty of the turning leaves of the maple forest that surrounds him just as night overtakes the day, and darkness prevails. His heart implores him to stop, and take in all of the beauty around him. First before you get to the full translation, I must tell you that Chinese poetry is a lot different than what we have in the west. Chinese words simply don't rhyme in the same way that English, or other western languages do. Chinese poetry depends on rhythm and a certain beat of repeated numbers of characters. I have done my best to translate this poem keeping a certain feel of the original poet. But some of the original beauty of the poem in it's original Chinese will be lost in translation. Far away on Cold Mountain, a stone path leads upwards. Among white clouds, people's homes reside. Stopping my carriage I must, as to admire the maple forest at nights fall. In awe of autumn leaves showing more red than even flowers of early spring. Hopefully, this poem will remind you to stop, and "take it all in" as you travel through life. The poet's name is "Du Mu" in Chinese that is: . 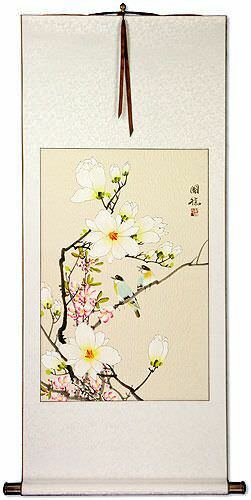 You can have the title, poet's name, and even Tang Dynasty written as an inscription on your custom wall scroll if you like. Dumu lived from 803-852 AD and was a leading Chinese poet during the later part of the Tang dynasty. He was born in Chang'an, a city of central China and former capital of the ancient Chinese empire in 221-206 BC. In present-day China, his birthplace is currently known as Xi'an, the home of the Terracotta Soldiers. He was awarded his Jinshi degree (an exam administered by the emperor's court which leads to becoming an official of the court) at the age of 25, and went on to hold many official positions over the years. However, he never achieved a high rank, apparently because of some disputes between various factions, and his family's criticism of the government. His last post in the court was his appointment to the office of Secretariat Drafter. During his life, he wrote scores of narrative poems, as well as a commentary on the Art of War and many letters of advice to high officials. His poems were often very realistic, and often depicted every day life. He wrote poems about everything, from drinking beer in a tavern to weepy poems about lost love. The thing that strikes you most is the fact even after 1200 years, not much has changed about the beauty of nature, toils and troubles of love and beer drinking. Some people may refer to this entry as Flowers Fall Kanji, Flowers Fall Characters, Flowers Fall in Mandarin Chinese, Flowers Fall Characters, Flowers Fall in Chinese Writing, Flowers Fall in Japanese Writing, Flowers Fall in Asian Writing, Flowers Fall Ideograms, Chinese Flowers Fall symbols, Flowers Fall Hieroglyphics, Flowers Fall Glyphs, Flowers Fall in Chinese Letters, Flowers Fall Hanzi, Flowers Fall in Japanese Kanji, Flowers Fall Pictograms, Flowers Fall in the Chinese Written-Language, or Flowers Fall in the Japanese Written-Language. 9 people have searched for Flowers Fall in Chinese or Japanese in the past year.